In the mid- and late 1800s Switzerland was already full of different railroads, almost none of which cooperated in any way. The technical systems as well as ticketing and timetables were a full mess. Industrialisation of the country pressed on and the need for efficient railroad connections and goods transport became more and more obvious. There was by no means a lack of railroads: at the end of the 1800s this small country had already 3091 km of normal gauge, 507 km narrow gauge and over 270 km tram railroad. Finally, in a popular vote - as the Swiss tradition goes - on the 20th February 1898 the Swiss people decided it was time to socialise the most important railroad companies and "buy them back to the state". The idea of the Swiss state railways had been born. SBB saw finally daylight as an organisation in 1902 after several complicated political discussions. Important railroad companies such as the Vereinigten Schweizerbahnen VSB and the Jura-Simplon-Bahn JS were rapidly bought. After extremely difficult political play also the strategic Gotthard mountain route through the Alps was forcefully taken over from its owners and added to the SBB network in 1909. SBB got its first at the time modern locomotives in 1907 when the strong and fast A 3/5 steam engines started pulling first state express trains. It hasn´t been all smooth sailing and the socialisation was never properly completed, but nevertheless, today´s SBB is clearly one of Europe´s leading train companies with a large network, modern and impressive trains and surprisingly numerous users - operating on difficult mountain lines with punctuality taken almost to perfection - something that most other state railroads can only dream about. 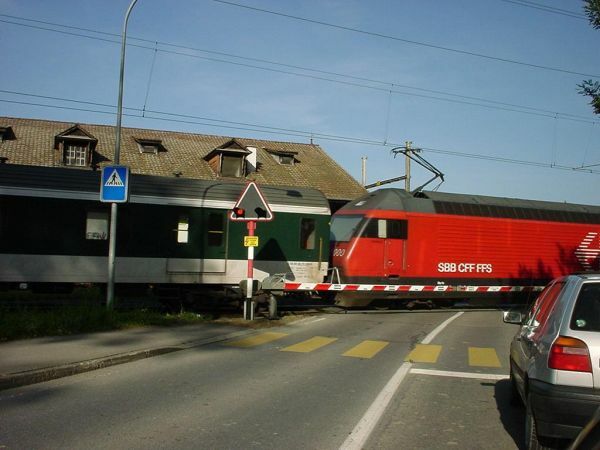 Re 4/4 and Re 460 are probably the two most famous SBB locomotives of all times. 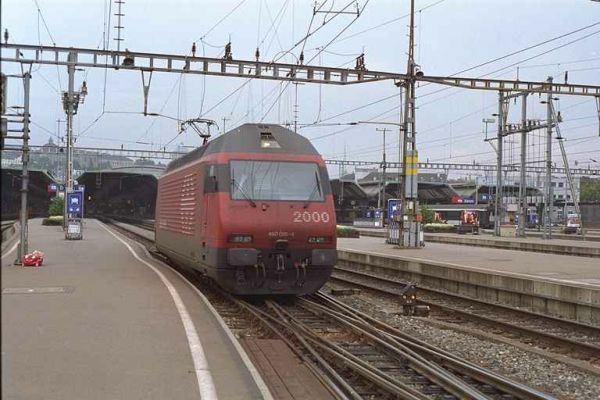 Picture of an Re 4/4 stopping at the station of Thalwil 21.10.2001 by Ilkka Siissalo. The first generation Re 4/4 locomotives of Switzerland have disapperared except for some museum specimens. 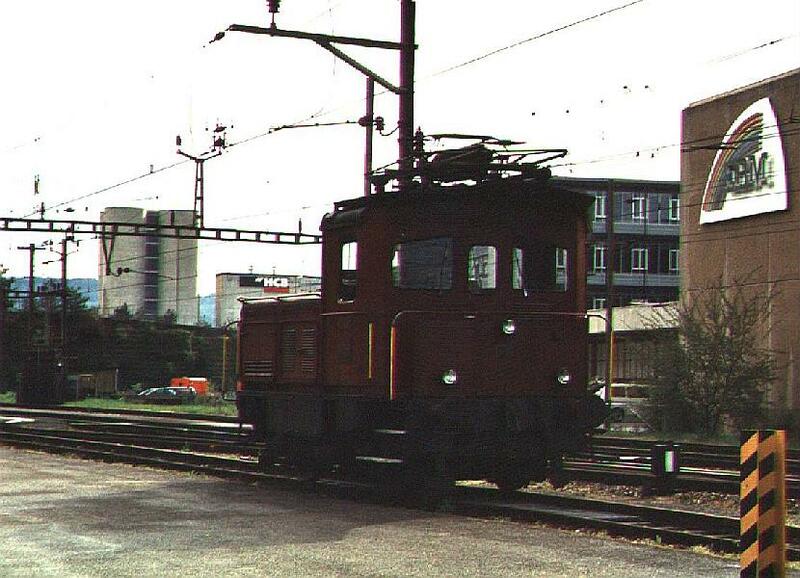 A couple of them are still used by the private BLS Lötschbergbahn to drag heavy cargo trains. 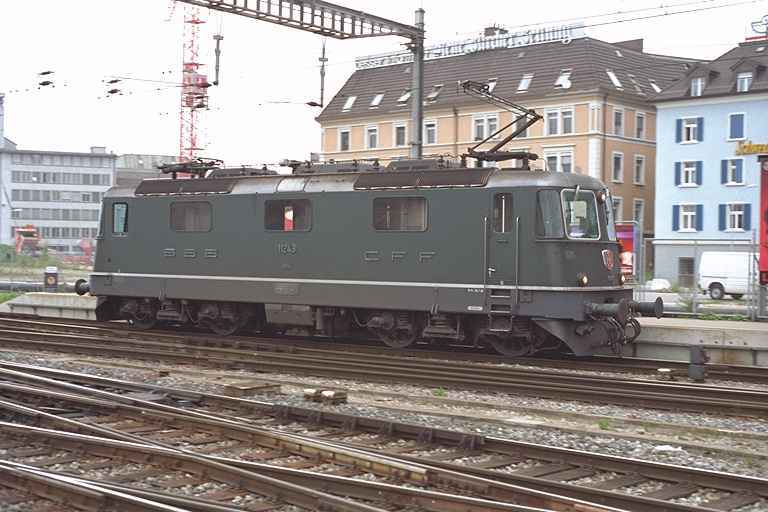 But the BLS Re 4/4 I is not the same as the SBB Re 4/4 I - in fact the BLS construction is from the mid-sixties and based on modern thyristor technology, whereas the SBB Re 4/4 I series is from the mid-fourties. 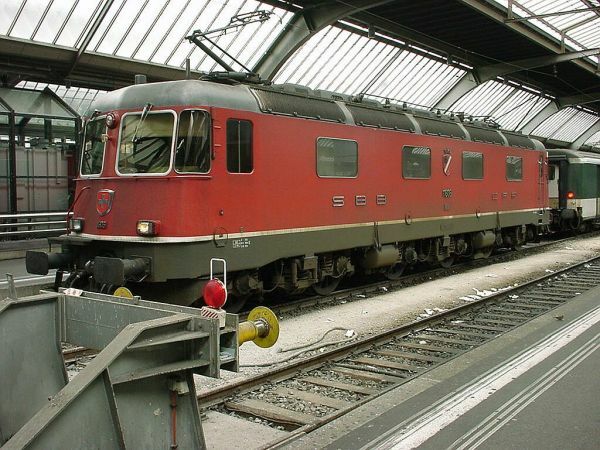 SBB had three or four of them still in the late 1990s at the Basel station to perform switcher locomotive tasks, mainly to move passenger coaches through their wagon washing line, but also they are now long gone. This SBB Re 4/4 1. series no. 10037 seen here at the Basel SBB station was built in 1950. Here it was still in switching work in Basel. It weighs 57 tons and has a maximum speed of 125 km/h. Its original number in the 1950s was no. 437. A scanned old paper photo taken in May 1999 by Ilkka Siissalo. Two first series Re 4/4 locomotives of 1950 still in switcher work at the Basel SBB station. Photo from May 1999 by Ilkka Siissalo. After the second world war traffic on the mountainous Gotthard and Simplon pass railways increased quickly and bigger and stronger locomotives than the pre-war 1. series Re 4/4´s were quickly needed. This led to the development of a six axle Co´Co´type locomotive, designed as a universal loco for both fast passenger trains and heavy cargo trains. The type Ae 6/6 - Swiss pride of the fifties - is powerful, 4300 kW. Prototypes were built in 1952-53 and the type became so popular that all together 120 units were built between 1952-66. Numbers 11401-11425 look different from the others, with a broad chromed stripe on the sides (see the red front of a second Ae 6/6 on the left of the picture showing the chrome band). Number 11500 shown on this picture was built in 1955 by the SLM-BBC-MFO group. It is 18,4 m long, weighs 120 tons and is designed for speeds up to 125 km/h. The Ae 6/6 was for tens of years the most popular engine in front of fast passenger trains. However, the stiff 6 axle Co´Co´design of the heavy Ae 6/6 causes by far more stress and damage to railroad tracks than more modern locomotives, and since the mid-seventies the type was quickly replaced in passenger train use by smaller and more versatile Re 4/4 3. and 4. series locomotives. Today the old Ae 6/6 is no more in regular use. 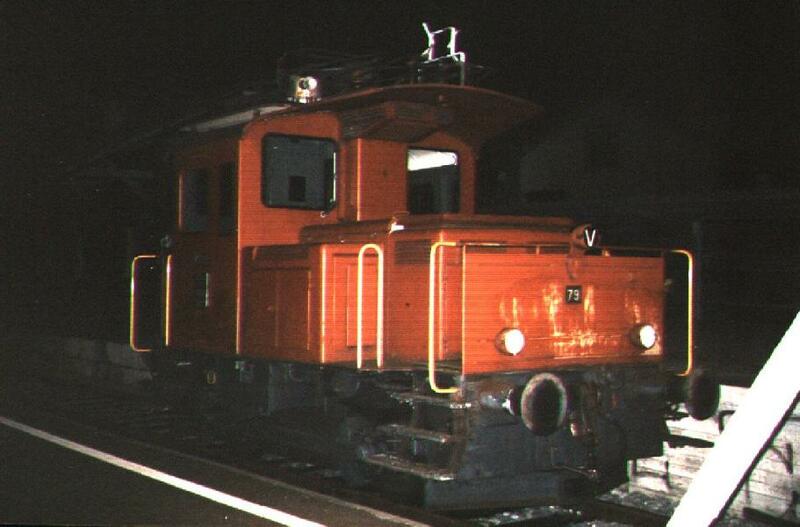 Picture from July 1999 at Delemont station by Ilkka Siissalo. Second view of an Ae 6/6 six axle allround locomotive from the fifties. This number 11416 is from the long series built in 1955. Every Ae 6/6 got its own name. The first ones were named after the Swiss Kantons, but as these soon ended, the next ones were named after Kanton capital towns and cities. This one also shows the characteristic broad chrome stripes around the whole locomotive, which were very typical of the Ae 6/6. Still as late as end of the sixties this type - then painted dark green - was the most often seen locomotive in front of fast passenger trains and it took care of almost all traffic on the Gotthard and Simplon mountain routes until finally replaced by the Re 6/6 in late 70s and beginning of the 80s. The original Ae 6/6 shown here is 18,4 metres long, weighs 120 tons but has only 4300 kW of pulling power - less than the much smaller Re 4/4, yet it stressed and broke railroad tracks much more than the smaller Re, especially in curvaceous mountain lines. Maximum speed of the Ae 6/6 is 125 km/h. Picture in July 1999 by Ilkka Siissalo. These Ae 6/6 locomotives had been sidetracked as a reserve. These were the no. 11488 which carries the name "Mendrisio" and no. 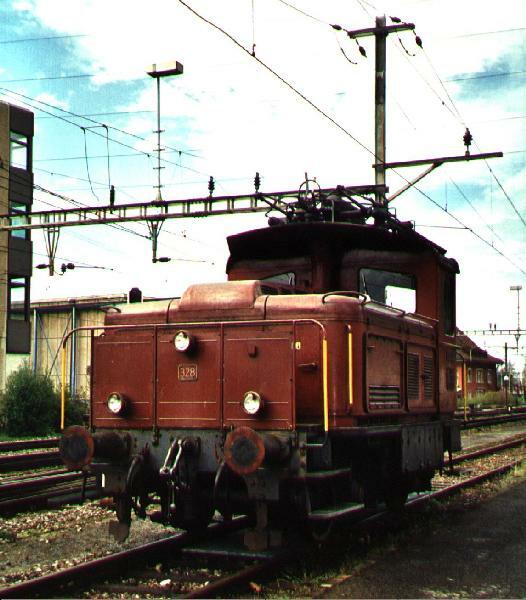 11409 "Baselland", sitting idly on a side track at Bülach station in September 2001. "Baselland" in the back still had the characteristic chrome stripes of the "Kantonsloks", those machines which were named after the Swiss Kantons, "Mendrisio", whose front shows properly on the picture, was a so called "Städtelok" or one that was named after the Kanton capital towns. It has never had them. Both were in the original green colours of the fifties - and as far as the rust can tell - had not received much attention since they were built in 1955. The problem of the Ae 6/6 was the extreme length of the stiff Co´Co´ type bogies which are 4,30 metres long. 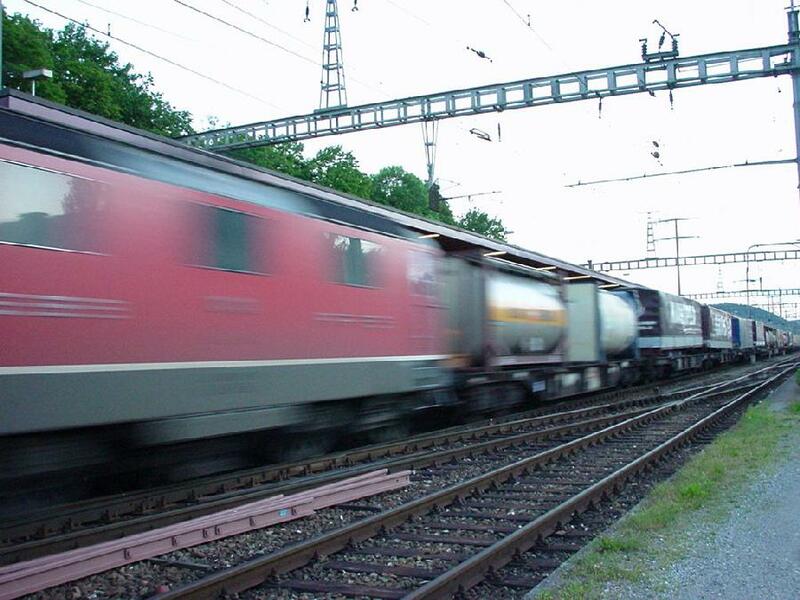 This means that in steep curves the first and the last wheels of the bogies cause extreme stresses to the railroad tracks and grind and break them - and Switzerland has more curves than any other railroad country: 15% of the whole SBB network is curve. Picture from September 2001 by Ilkka Siissalo. Closeup of the front of Ae 6/6 no 11409 "Baselland". If it were not so dirty and rusty it would still have been a good and fairly modern looking locomotive. The designers of SLM and BBC did a good job in mid-fifties. Picture in September 2001 at Bülach station by Ilkka Siissalo. SBB Re 4/4 II series no. 11243 at Zürich Hbf. 19 September 1995. This one is from the long series built in 1969 and it is here still in its original dark green livery. 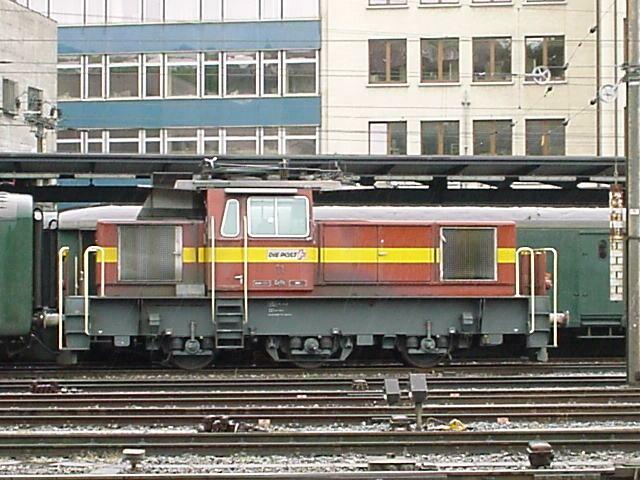 An unidentified SBB Re 4/4 III series locomotive at Zürich Hbf. 19th September 1995. Photo by Erik Hjelme. SBB Re 4/4 III no. 11352 of the 3. generation from the last series of 1971 - a little bit longer than Re 4/4 II, with rectangular lights. 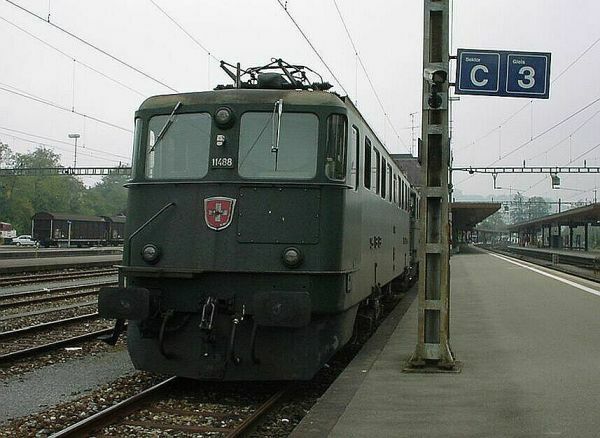 At that time, although a more modern construction (the Re 4/4 IV or what is today Re 446 at the Südostbahn) existed already, the SBB needed more allround locomotives and did not want to mess with the "children´s sicknesses" of the 4. generation and wanted instead more of the old, but well known and well liked stuff. This variant was a little longer and a little more powerful; it was designed specifically with the Gotthard mountain line in mind. The locomotive is 15,41 metres long (Re 4/4 II is 14,8 or 14,9 m), weighs 80 tonnes, has a maximum speed of 125 km/h (as opposed to 140 of the earlier ones) and generates 4700 kW of power (like the old one), but can have a pulling force of 280 kN (as opposed to 167). Partly later replaced by the much bigger and more powerful Re 6/6, these allrounders can still be seen all over Switzerland - like here on the Juraline in Delemont in the north - but are still most often used on the Gotthard line bundled together with an Re 6/6 to create what is called Re 10/10 "virtual locomotive": a commonly seen pair. The Re 6/6 with its power of 7900 kW was for a long time the strongest locomotive in the world (and Switzerland). It has 6 axels in the somewhat rare Bo´Bo´Bo´ order. The first 4 prototypes built in 1972 had an articulated joint for improved bending in tight curves, but this was omitted as unnecessary in the series of 1975 (shown). This somewhat dark (sorry for that!) picture of an unidentified Re 6/6 and 2.series Re 4/4 shows the similarity and difference in size of these two famous locomotives. 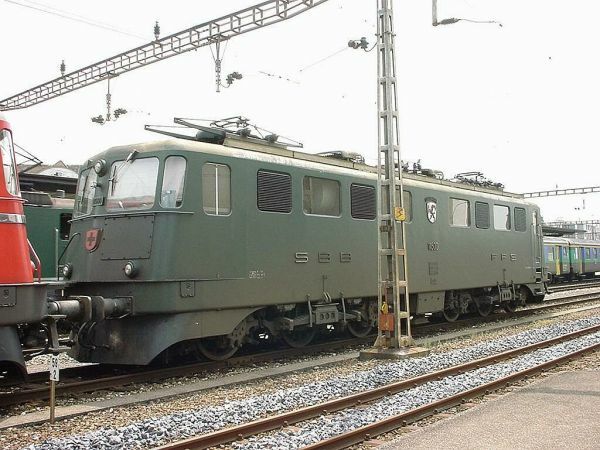 The Re 4/4 2.series has 4 axles, was built 1969-83 in almost 200 copies and was in the 1990s the most often seen locomotive in front of passenger trains. 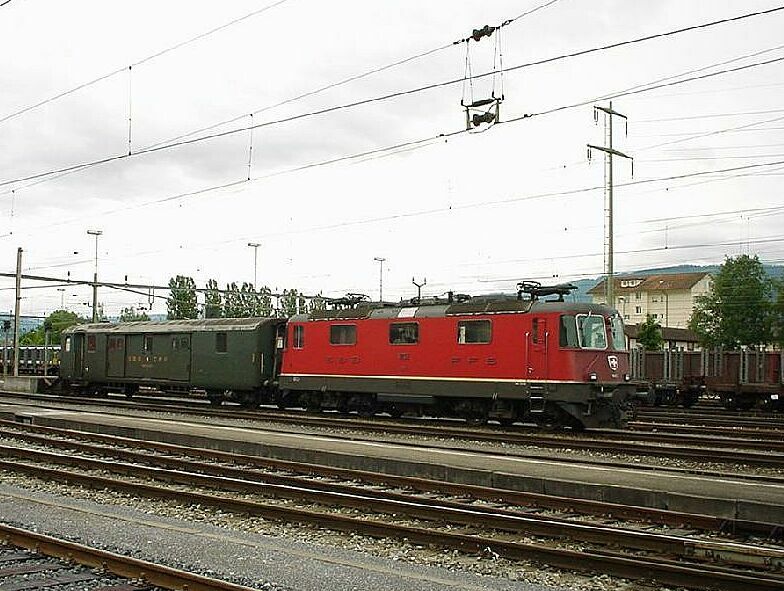 The 6 axle "big brother" Re 6/6 is used mainly on the Gotthard railroad and in front of extremely heavy cargo trains. The usual "Gotthard combination" is one of both, forming a 10 axle really powerful combination. 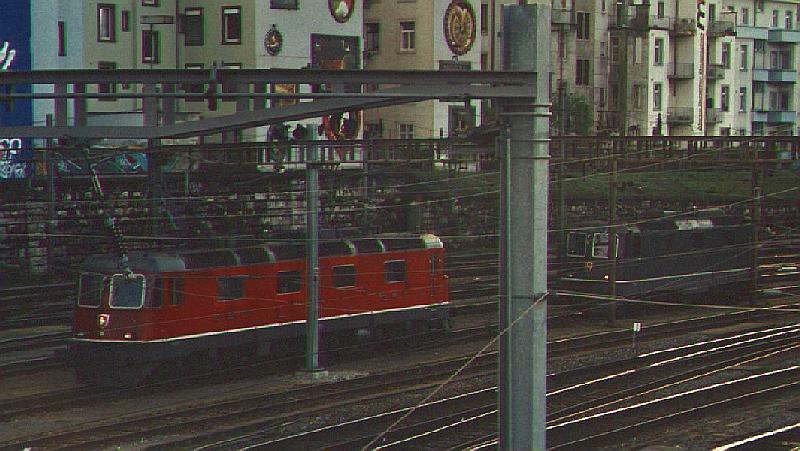 SBB Re 6/6 no 11632 in front of a particularly heavy cargo train, stopping at the Münchenstein station to pick up a new driver. This locomotive, built in 1975 is one of a very successful series of 85 engines - still the most powerful locomotive of Switzerland. 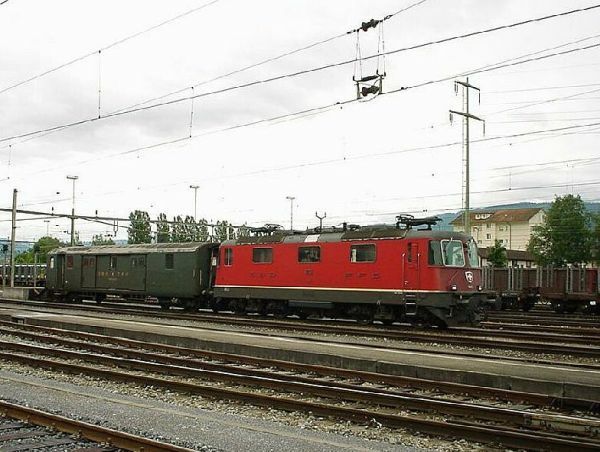 On this Juraline and also on the Gotthard line, when the power of an Re6/6 is not enough, these engines are often combined together with the similar but smaller Re4/4. Photo May 1999 by Ilkka Siissalo. 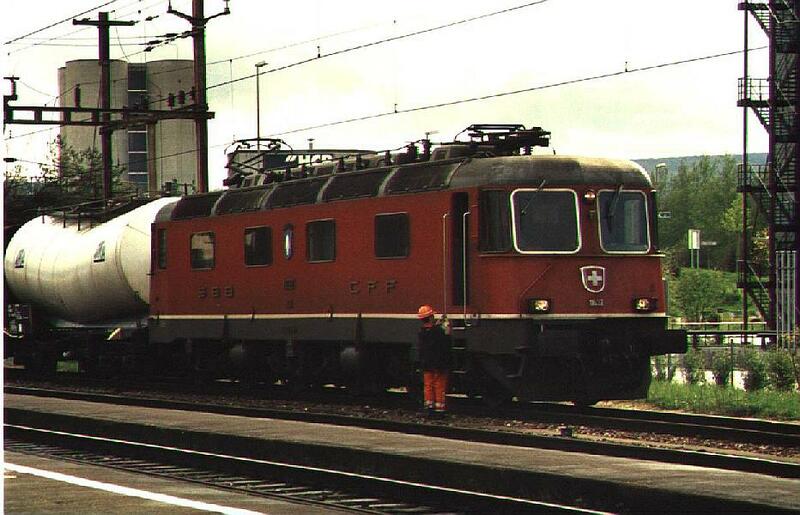 SBB Re 6/6 no 11632 shown sideways so that its remarkable length and six Bo´Bo´Bo´ evenly dispersed axles are shown. To be able to slightly bend in curves at high speed, specially designed bearings are used; the middle axles can move sideways. Photo from Münchenstein, May 1999 by Ilkka Siissalo. A closeup view of the Re 6/6 no. 11606 from the second series, built in 1975. It is still by today´s standards a remarkably good looking engine, although the basic design is already from the 1960s. Photo at Zürich Hauptbahnhof 9.6.2002 by Ilkka Siissalo. The shutter speed of a Sony digital camera is not nearly fast enough to stop the movement of a heavy cargo train rushing full speed southwards, probably towards the Gotthard line. Headed by one Re 6/6 and one Re 4/4 which both have a maximum allowed operating speed of 140 km/h the train encompasses more than 30 heavy cargo wagons. Photo 4th of June 1999 in Rheinfelden by Ilkka Siissalo. SBB Re 460 'Lok 2000' (VI generation of Re 4/4) no. 28 at Zürich Hbf, 19th September 1995. Another view of the "Lok 2000" or Re 460. Nowadays many of the Re 460s have lost their original red painting in favor of sometimes very ugly commercial liveries acting as moving ads for this or that product. Here is still the mighty locomotive as it is. Its maximum speed is a thrilling 230 km/h. In practise speeds of up to 200 km/h are actually used on the main lines. 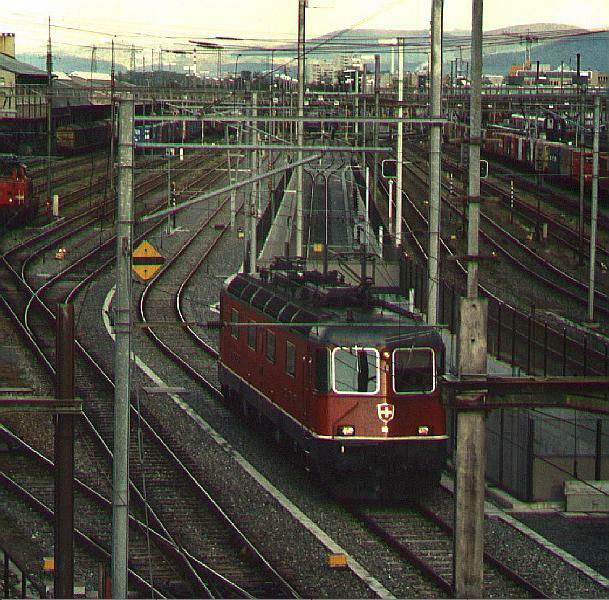 Photo from Zürich Hauptbahnhof (main station) in 1999 by Ilkka Siissalo. A quick shot from a car window: an express train on the way from Bern towards Thun and Interlaken in full speed, probably well over 120 km/h, by the Worb SBB station. 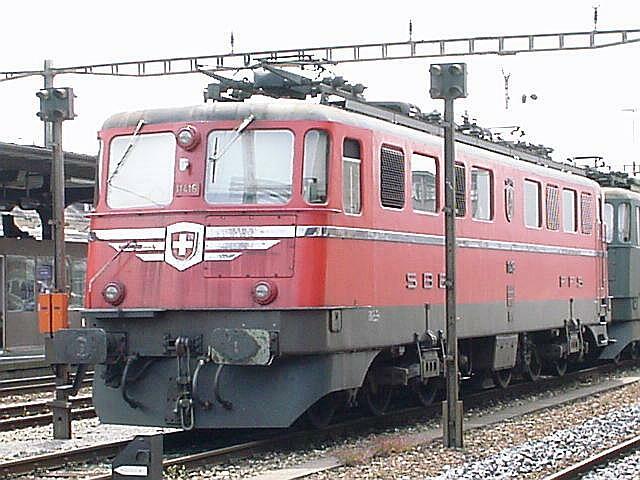 The locomotive Re 460 or "Lok 2000" with its stylish Pininfarina design is the pride of the Swiss. These locomotives have also been sold to e.g. Norway and Finland. Germany was highly interested in buying them as well, but could not afford the "astronomical" (as they put it) price. They developed instead their present-day Baureihe 101 and 145 locomotives based on the so called "EuroSprinter" concept. In Finland the admittedly beautiful and powerful "Lok 2000" was not such an immediate success, as the state VR complained about overheating wheel bearings - "Something absolutely unacceptable in this class and this priced locomotives" as they put it. 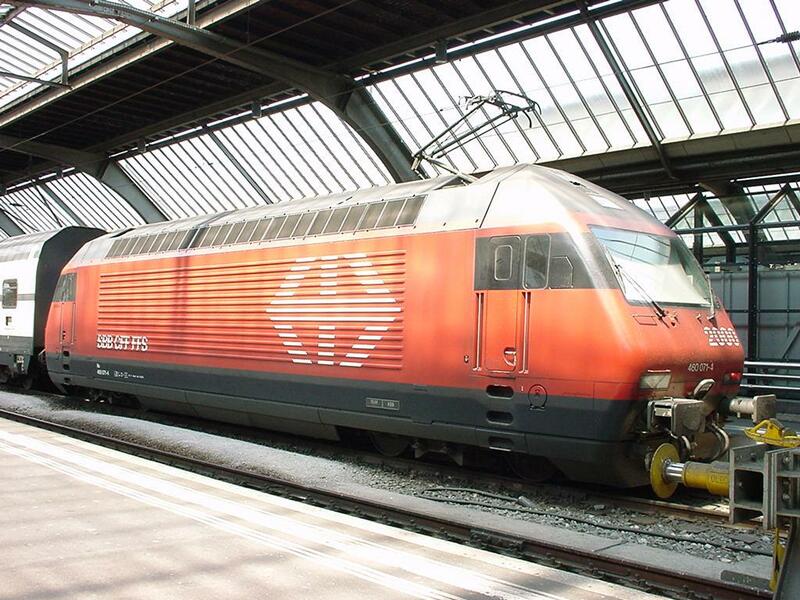 SBB has in Switzerland 119 of these beautiful locomotives and they form the basis of all high speed traffic nowadays. Photo 14.10.2001 in Worb near Bern by Ilkka Siissalo. 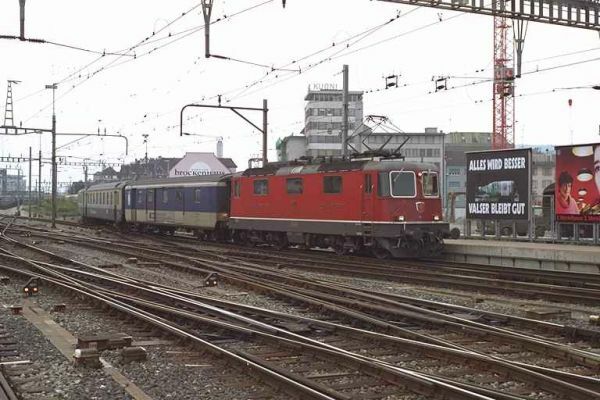 Many of the modern SBB locomotives of the "Lok 2000" are painted or taped in advertisement colours; here an example of no. 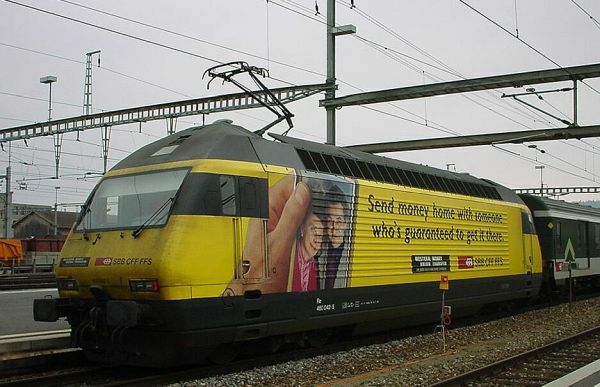 42, which on 1st November 2001 was advertising international money transfers, presumably for the tens of thousands of foreigners who live and work in Switzerland and send money back home. Some of the advertisements look fairly tasteless; this one is actually not too bad, but the nice looking locomotive would definitely benefit from a good wash :-) Here the locomotive was pushing an IC train from Zürich to Geneve airport, and making a halt at Yverdon. 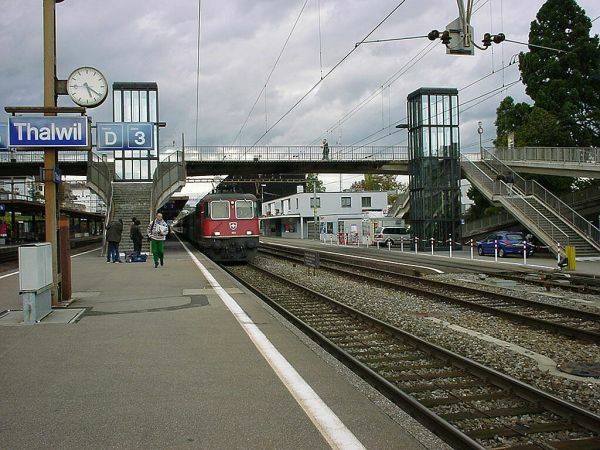 Photo from Yverdon station 1. Nov. 2001 by Ilkka Siissalo. An unidentified Ee 3/3 locomotive of the Swiss Post and Telecom PTT, switching mail wagons at Bern Hauptbhanhof (main station). These small electric engines were built in 1991. It weighs 48 tonnes, is only 11,20 m long and has a maximum speed of 75 km/h. Builder is the SLM/ABB group which later became part of Adtranz and finally Bombardier group. Photo from Bern station in June 1999 by Ilkka Siissalo. Uploaded Jun 6, 2002. 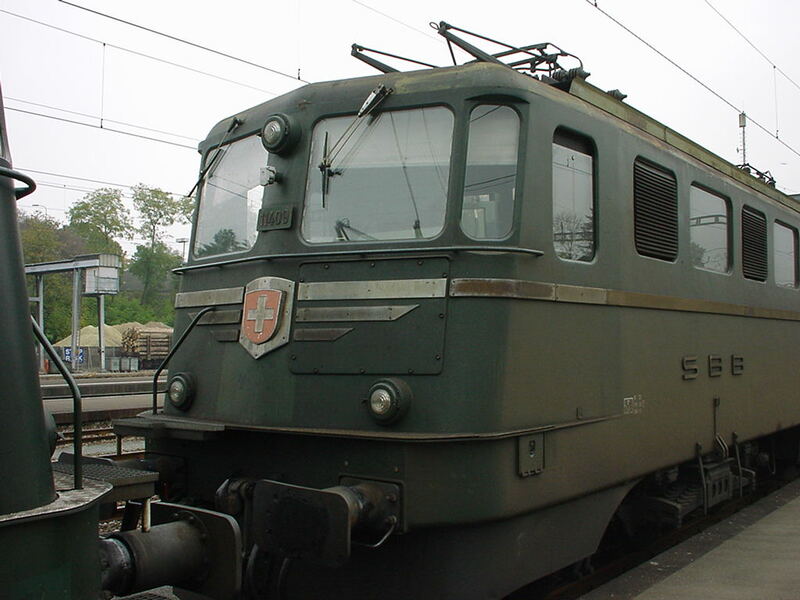 A small electric SBB locomotive of the Te 2. series of 1967, no. 79, night time at Liestal station, Baselland. Te´s were built by SLM, Tuchschmid AG and Maschinenfabrik Oerlikon. The locomotive weighs 22 tons and has a maximum speed of 60 km/h. Photo in November 1998 by Ilkka Siissalo. The Tem 3.series locomotive no. 328 is actually not classified by SBB as a locomotive but a "rail tractor" with both a diesel and an electric engine. It is used in light switching work and in rail construction work as a helper. Built by SLM, Secheron and Brown Boveri, it weights 32 tons and has a maximum speed of 60 km/h. Photo from Münchenstein, May 1999 by Ilkka Siissalo. The Tem 3.series no. 328 seen from the other side. It doesn´t look like a tractor to me ! Photo from Münchenstein, May 1999 by Ilkka Siissalo. 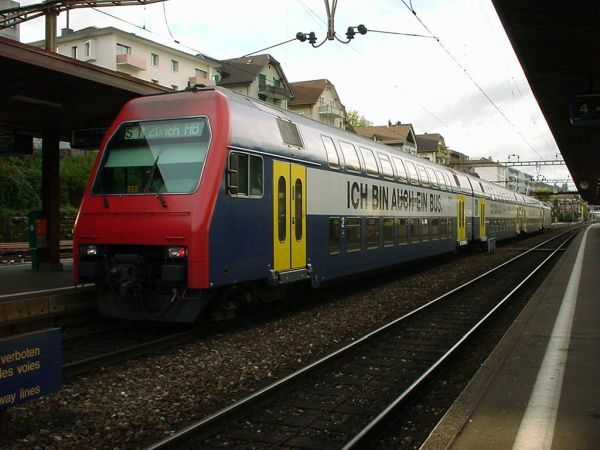 A typical Zürich S-Bahn, here still unmodernised, an Re 450 (or 5. generation Re 4/4) with always 3 double decker coaches, the last one of which has a cockpit very similar to the one at the locomotive end. The Re 450 is a modification actually of the Re 460 "Lok 2000", the pride of Switzerland, but intended only for the use of pulling or pushing double decker coaches at the Zürcher S-Bahn. For this purpose it does not have to be as fast or as powerful as the original Lok 2000, but it still retains some of the design features. SBB has 115 of these locomotives (and 3 coach units attached to them), built 1989-97. The locomotive itself is 18,4 metres long, weighs 74 tonnes and has a maximum speed of 130 km/h. Photo from Zürich Hauptbahnhof (main station) in 1999 by Ilkka Siissalo. A steering cab coach of a typical Zürich S-Bahn train Re 450. 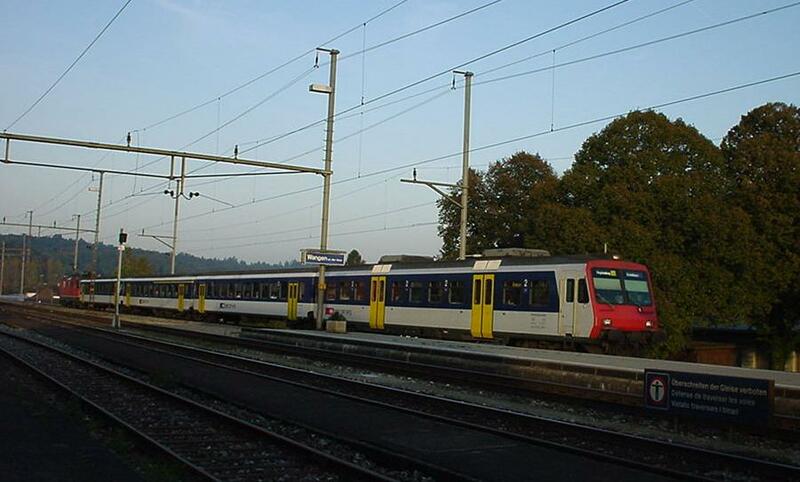 Photo from Thalwil station 21.10.2001 by Ilkka Siissalo. Uploaded 24 June, 2002. The Re 450 with its train is always a fixed 3 coach plus locomotive unit. At peak traffic two units may be coupled together. 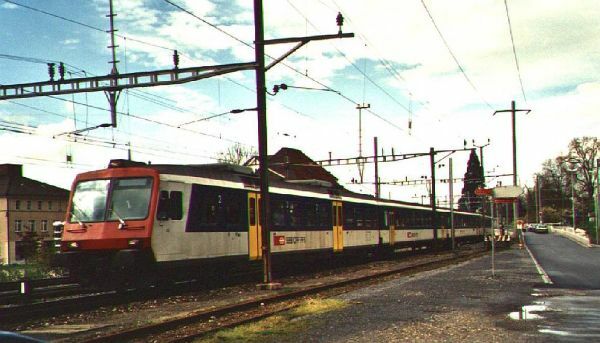 SBB has 115 of these units, built between 1989 and 1997. 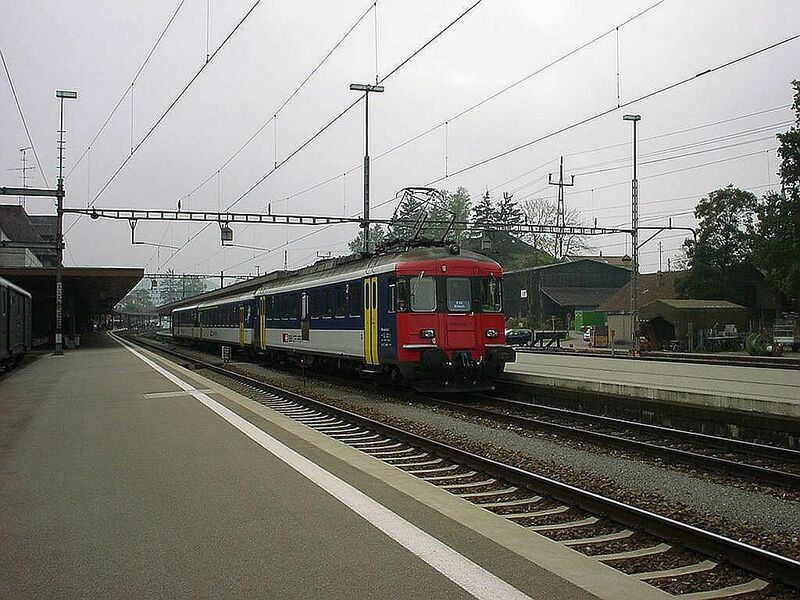 Photo from Thalwil station 21.10.2001 by Ilkka Siissalo. 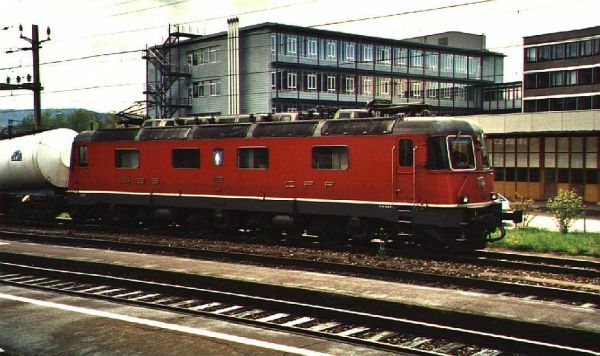 A typical modern Swiss regional train of the 1980´s (so called NPZ concept train), an unidentified RBDe 560 1. series electric motor unit of the SBB on its way from Basel to Laufen on the Juraline, stopping here at the Münchenstein station close to Basel. The first prototypes of these trains were ordered by SBB in 1984 based on the good experiences of similar trains of private companies such as the BLS. Basically the same train, with some modifications, is in use within several private Swiss railroads and also in Germany in the Bodensee area. Its maximum speed is 140 km/h (some variants 125 km/h). For the Basel area traffic SBB had six units designated RBDe 562 for the Regio-S-Bahn-Basel-Mulhouse service, which had dual electric systems, both for the German/Swiss 15 kV 16,7 Hz and for the French/Italian/Spanish/Hungarian etc. 25 kV 50 Hz. 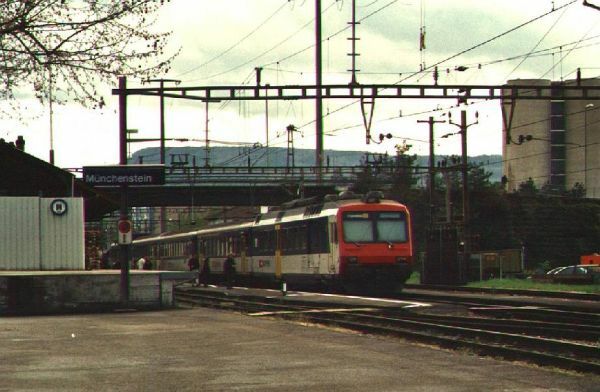 These trains used to run on pendel routes via Basel, where the other end was in Mulhouse (Müllhausen) in French Alsace (Elsass) and the other end in Switzerland, for example in Laufen, where this train is going to. Photo May 1999 by Ilkka Siissalo. Uploaded Jun 5, 1999. An unidentified SBB RBDe 560 1.series EMU (maybe RBDe 562) leading a long train from Basel to the Münchenstein station on its way to Laufen on the Juraline. 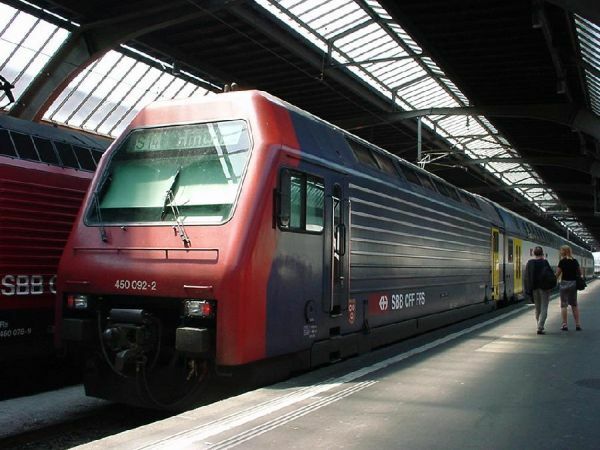 A typical Swiss regional EMU train of the federal SBB, here a fairly long one, with an RBDe 560 series electric motor unit pushing from the back and a matching coach with a steering cab coach in front. Photo 4th of June 1999 at Liestal station by Ilkka Siissalo. 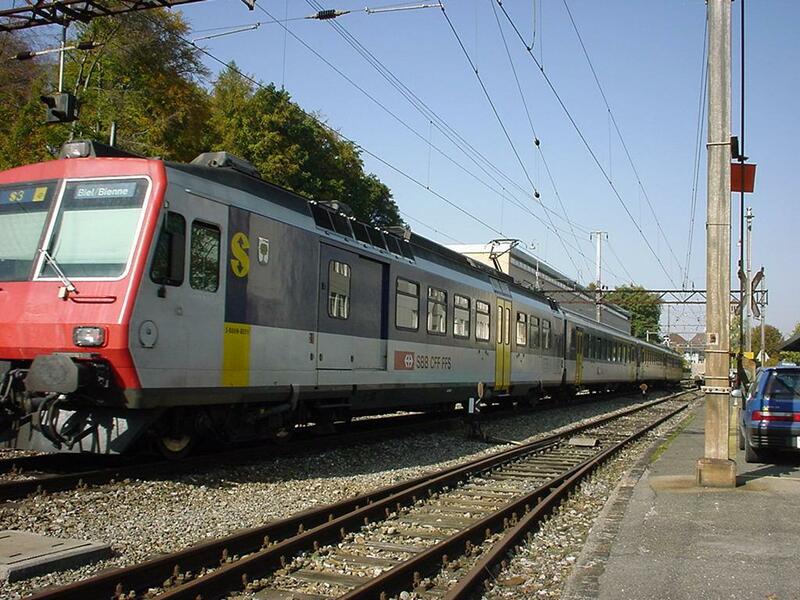 Closup of a suburban SBB commuter train of the type RBDe 560, this time with a yellow S-Bahn-Bern stripe on its side. 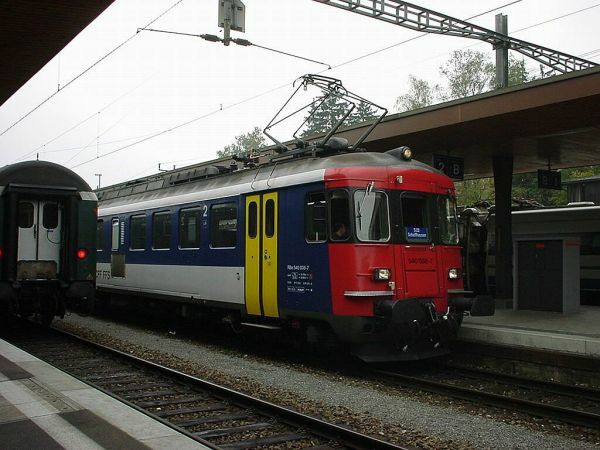 Photo of SBB RBDe 560 on S-bahn line S3 on 15.10.2001 at Bern-Weissenbühl station, on its way from Thun via Bern to Biel by Ilkka Siissalo. 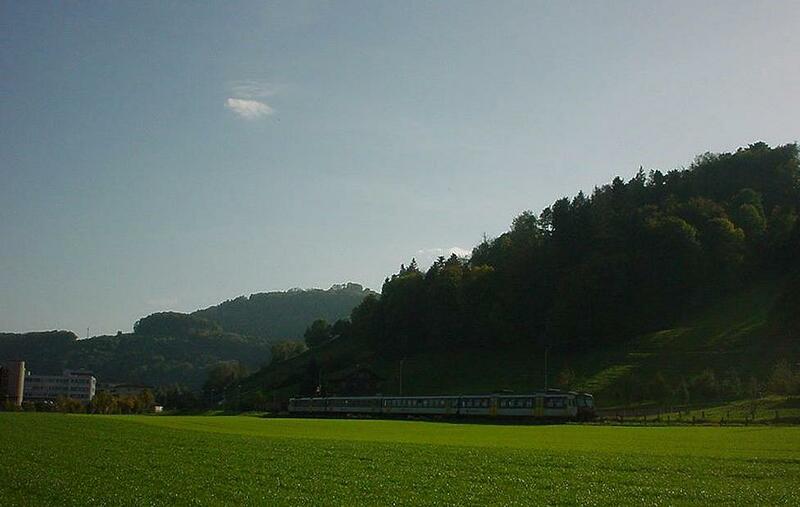 A typical Swiss regional train, powered by an RBDe 560 unit in a nice countryside setting close to Belp, on the Bern S-Bahn S3 line between Bern and Thun. Photo 14.10.2001 by Ilkka Siissalo. It looks like a very normal suburban commuter train, but it´s not normal at all. These regional trains are always driven by the RBDe 560 series electric motor units, which look very much the same as the coaches, or, in rare cases, by older EMUs like the RBDe 540. This train is missing its EMU motor wagon and has received an Re 4/4 universal locomotive in its place to replace it. 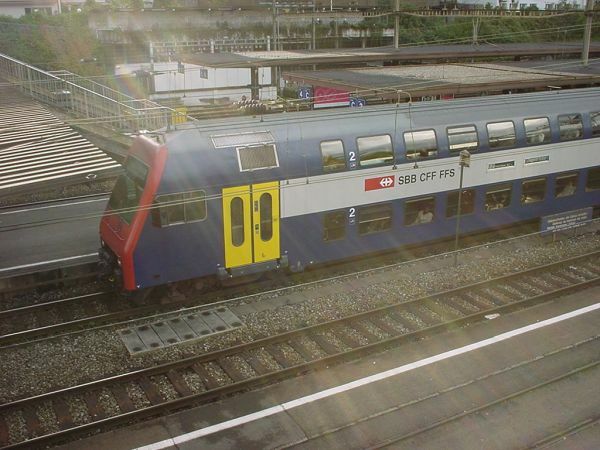 State SBB had a shortage of its RBDe 560 EMUs due to repairs and similar instances and this kind of odd combinations were seen sometimes in short haul S-Bahn traffic in Bern and Basel. Photo from Wangen, near Bern 14.10.2001 by Ilkka Siissalo. The RBe 540, or originally RBe 4/4 was first built in a 5 train prototype series in 1959 and then in series between 1963 and 1969. Altogether SBB had 76 of these trains. Originally painted dark green, they were used in fast long haul train connections, as e.g. express trains between major cities, for example between Zürich and Bern and Geneve. They were the new, modern trains which took care of most of the visitor traffic at the "Landesausstellung 1964", the major national exhibition of the sixties. 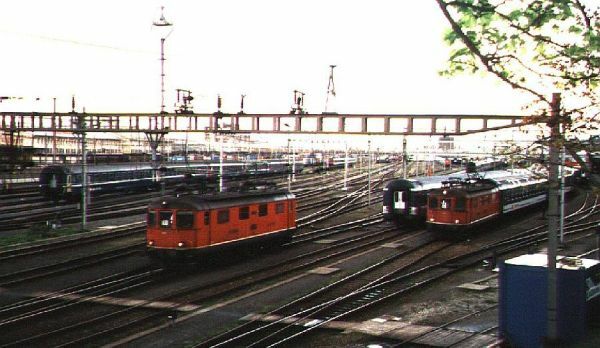 Later when traffic increased, these motor wagons were pushed to do S-Bahn service, mainly as the workhorses in front of heavy and long short haul commuter S-trains. 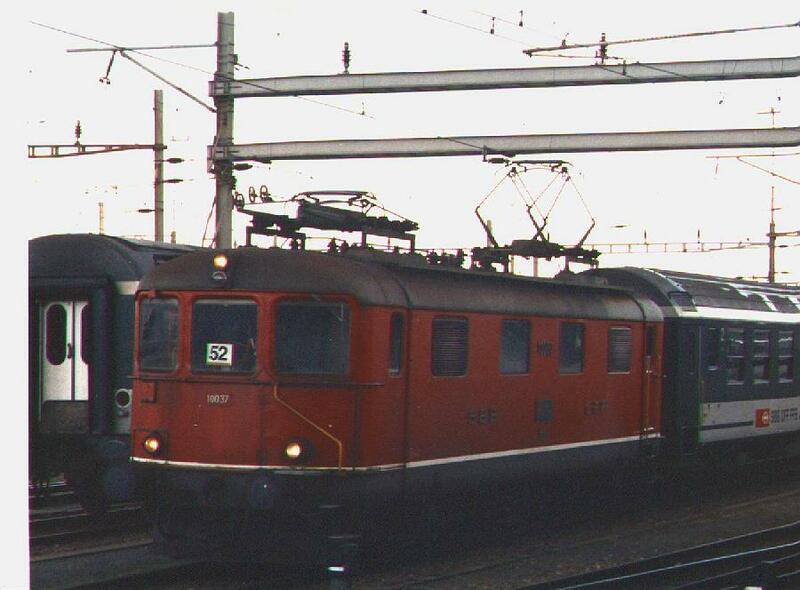 In 1991 the trains were thoroughly refurbished, repainted and got their new numbering RBe 540. Today they are used only rarely and in less important S-Bahn services, like here between Bülach and Schaffhausen. Picture in September 2001 from Bülach station by Ilkka Siissalo. Closeup of the front of the RBe 540 no.38. This electric motor unit was built in 1963, it weighs 68 tonnes, has a maximum speed of 125 km/h and is 23,7 metres long. As many other national railways, now also the Swiss federal SBB has ordered modern electric motor units, so called "bullet trains". 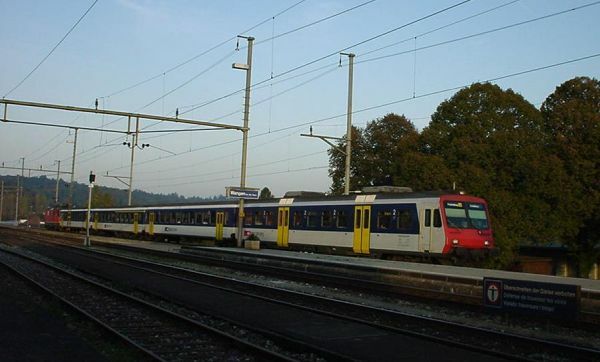 These trains, called ICN (InterCity Neigezug) or "Weisse Pfeil" (white arrow), were first delivered by ADtranz in 2000 and are now most often seen on the line between Zürich and Geneve airport, but also between Zürich and Winterthur or Schaffhausen or St. Gallen and Lausanne. In contrast to the similar trains in other countries - like the ICE in Germany or TGV in France - the ICNs are not particularly fast. They could be, but the timetables are organised in such a way that the trains keep frequently stopping even at small and unimportant stations like here in Oensingen. In fact they are even used in InterRegio services. Anyway, the trains are modern and comfortable. 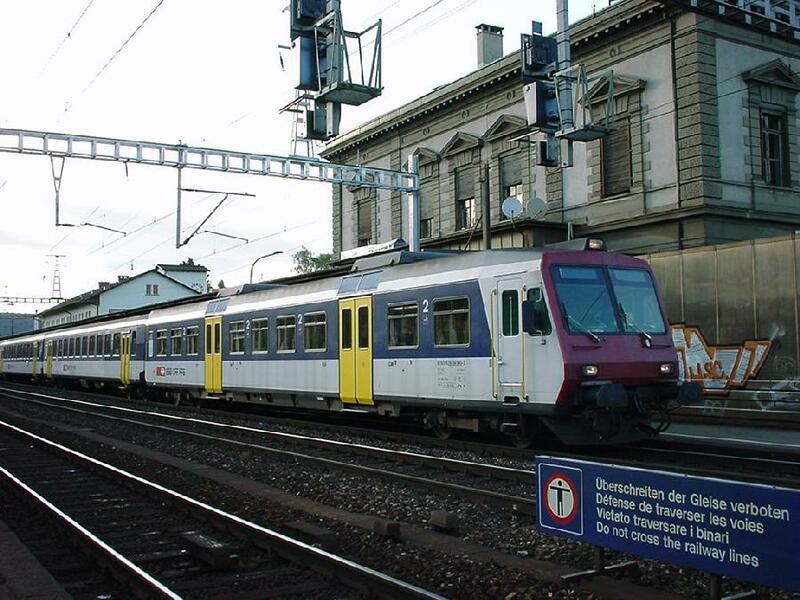 In November 2000 SBB had 13 units of the ICNs. They are always used as two unit combinations, giving a train 14 coaches long, with 940 sitting places. 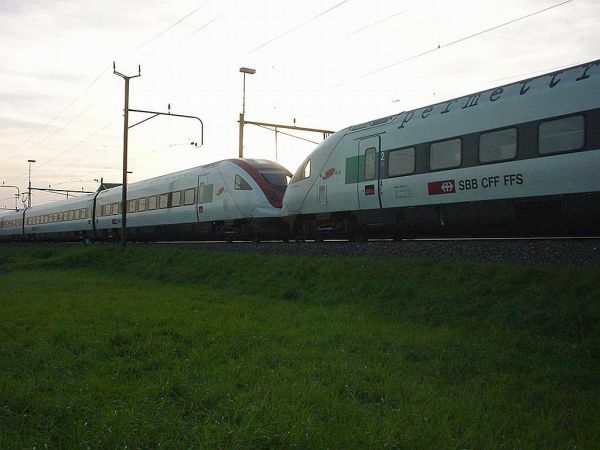 The ICN is based on the Italian Pendolino by Fiat, but built completely at ADtranz in Pratteln, close to Basel. One unit is 188,8 metres long, has 113 1. class, 12 business class and 326 2. class seats plus a restaurant with 23 seats. Each unit has 8 motors and 28 axles in 7 coaches. Maximum speed is a modest - for a modern "bullet train" - 200 km/h. Photo from Önsingen station 14.10.2001 by Ilkka Siissalo.